I see Dr. Hotez is of the Salkian Confidence Building school of thought. 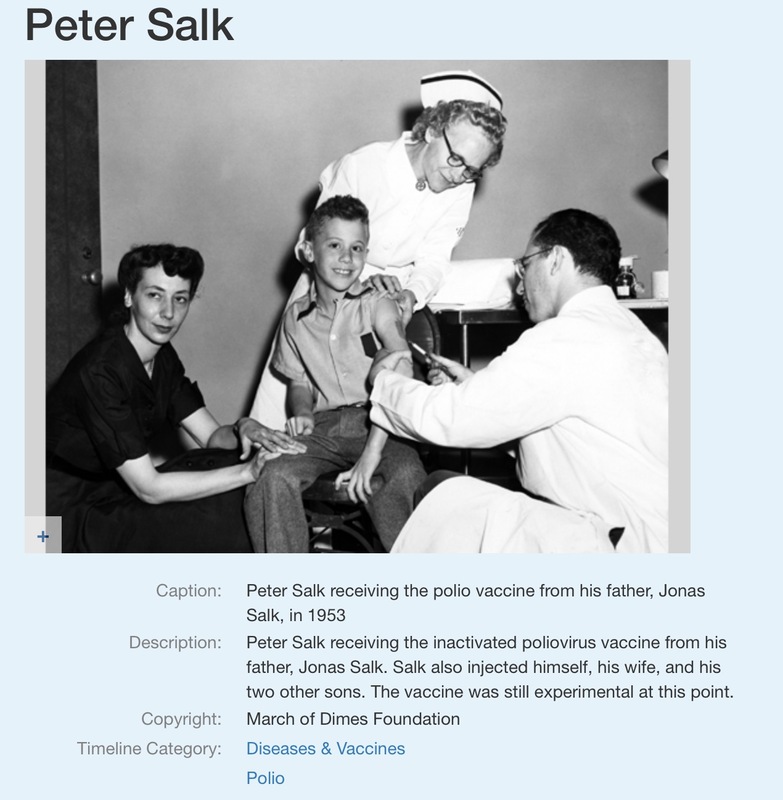 Salk injected himself, his wife, and their three sons with his experimental poliovirus vaccine. Description: Peter Salk receiving the inactivated poliovirus vaccine from his father, Jonas Salk. Salk also injected himself, his wife, and his two other sons. The vaccine was still experimental at this point. I mean what more proof do you need? Unlike most kids who cry & scream, Peter Salk took it like a champion - flashing his pearly whites for good measure. A great photo-op, isn't it? ICFreely, clinical trials can have issues too . . . especially in a disease like depression where a lot of it is subjective. But here is the big point. Clinical trials are all we've got to prove whether medicines work or not. If vaccines had actual clinical trials, then we could read through those trials and debate them. Right now vaccines are in the same category as homeopathy, bonecrackers, shamans, and other unproven kooky medical treatments. The key difference being that science people believe homeopathy and co. to be kooky, while claiming that “the debate over vaccinations is over”, as CluedIn's friend said. I am not going to comment on this story. sharpstuff wrote: I am not going to comment on this story. This screams of clickbait for the anti-vaccine movement to me. Doctor's note from 2012, any actual lawsuit? Plus, the GoFundMe account pretty standard now. I love the lack of family and friends comments/donations in the GoFundMe page and the Mom's story itself. Personally, I think it's easier to get fooled by the small stories than the big ones. I still don't like vaccines, but I would never use this story as a credible argument. Thank you for the insert, dear SCS. aa5 wrote: ICFreely, clinical trials can have issues too . . . especially in a disease like depression where a lot of it is subjective. Point taken, dear aa5. I see where you’re coming from. The fact that vaccine manufacturers haven’t conducted (blind/double blind placebo) clinical trials is quite telling in and of itself. I was trying to make the point that direct-to-consumer pharmaceutical advertising here in America and New Zealand have (in my opinion, intentionally) “poisoned the well” for clinical trials. The media’s power in influencing/tainting the outcome of courtroom cases is a known phenomenon. Judges sequester jurors in order to hopefully mitigate these effects in legal trials. I contend that clinical trials are subject to similar effects. In other words—over the last 22 years, Big Pharma ads have irreparably tainted the “jury pool.” Hope that makes sense. New York lawmakers on Thursday called to end non-medical exemptions vaccinations for school-aged children amid an ongoing measles outbreak. The proposed legislation is backed by a group of Democratic lawmakers who say they want to close the “personal belief loophole” which advocates for religious vaccine exemptions, The Journal News reported. "The goal here is to push legislation to remove all non-medical exemptions for vaccination for children to go to school in New York state," State Sen. David Carlucci (D) said. "We've seen the spread of measles really spread like wildfire in communities where the vaccination rates are not high." Carlucci added that religious groups he'd spoken to do not bar people from receiving vaccines. State Sen. Brad Hoylman echoed Carlucci, stating that there is no major religious group that advocates against vaccinations as part of its official doctrine. "New York’s religious belief exemption is a personal belief loophole," Hoylman said. "According to experts, no major religious group advocates against vaccinations as a matter of official doctrine." The lawmakers said only medical exemptions from vaccinations should be allowed. Hoylman criticized the modern anti-vaccine movement, which has persisted despite scientific research debunking the myth that measles, mumps and rubella (MMR) vaccine is linked to autism. The bill is currently in committee in both the state Senate and Assembly, the newspaper noted. If the legislation is signed into law, New York would become the fourth state that allows only medical exemptions for vaccinations. California passed a similar law in 2015 when a measles outbreak hit California. Mississippi and West Virginia also only allow medical exemptions for vaccinations. There have been more than 387 confirmed cases of measles in 15 different states between January 1 and March 28 of this year, according to the Center for Disease Control (CDC). It is the second largest number of cases reported since the virus was declared eliminated in 2000. There have been 259 confirmed cases of measles located in New York City as of April 3, according to the state. There have been additional cases confirmed in Rockland County, which declared a state of emergency over the outbreak in March. According to The Journal News, there have been 425 confirmed measles cases in Brooklyn, Queens and Rockland County. As stated in the above article, Californian closed the so called “personal belief loophole” in 2015. IMO, it won’t be long before congress either enacts similar federal legislation or withholds federal funds from states that don’t follow California & New York’s lead. Are you familiar with vaccinepapers.org, aa5? If so, I’m curious as to what your take on them is. I’m not sure whether or not they’re a more sophisticated variation of Barbara Loe Fisher’s NVIC.org. Why should I not trust the advice given by the majority of health care professionals in the world when it comes to something as important as preventing highly contagious and possibly deadly diseases? 1) Because medical science is the most corrupt of the sciences. It is extremely corrupt. Big pharma companies pay to have fake scientific papers written and published. Big pharma funds the medical science journals with advertising and reprint fees. Big pharma influences research and curriculum at medical schools. Big pharma pays for speaking fees and accommodations at medical-scientific conferences. Big pharma funds most medical research. So, the people selling the treatments are the ones that have the most influence over the direction of medicine: what ideas are acceptable and supported, and what ideas are neglected and discarded. And anything that doesn’t make them money (i.e. that’s non-patentable) is neglected, or denounced. 2) Medicine has a blind spot when it comes to iatrogenic (doctor-caused) diseases and damage. It’s psychologically distressing for doctors to be confronted with evidence that they have caused great harm to patients. Its difficult for orthodox medicine to objectively consider the science because they face the blame for the epidemic of vaccine injury. This creates a powerful incentive to believe vaccines are safe. Accordingly, orthodox medicine engages in motivated reasoning on the subject of vaccine injury. Combine corruption with the motivated reasoning, and the result is a medical system that makes incredibly bad decisions and harms millions of people. -Dr Peter Gotzsche, Deadly Medicines and Organized Crime: How Big Pharma Has Corrupted Healthcare (2013) page 11. An example of the hostility doctors display in response to discoveries of doctor-caused diseases is the story of Dr. Semmelweis. In the 1840s, he discovered that doctors were causing deadly infections in women by delivering babies with dirty hands. Doctors would go back and forth between the morgue and the delivery room without washing. Semmelweis proved that it was the unclean doctors causing the deaths, which they did not appreciate. Semmelweis’s discovery blamed his colleagues for killing people. Instead of being praised and rewarded for his important discovery, Semmelweis was ridiculed, viciously attacked and hounded out of medicine. And all Semmelweis was trying to do was convince other doctors to wash their hands! It took about 20 years until Semmelweis’s recommendations were in widespread use. Are you saying that doctors and medical professionals don’t look at the science? If so, why? Correct. They don’t. Doctors and public health people spend little time reading the literature for themselves. They foolishly trust the CDC and industry-funded trade groups to interpret the science and make recommendations for them, which they follow. The vaccine industry writes the vaccine recommendations. Doctors and most medical professionals are not independent thinkers. They don’t have the time or interest. Most simply follow the conventional recommendations and don’t question them. But what if the conventional recommendations are wrong? Medical consensus has been wrong many times in the past. Why should I trust you? You guys are just doing this for the money! Vaccinepapers.org makes no money, and never will. Vaccinepapers.org is strictly non-commercial. We have no advertising. We do not sell or recommend any products. We do not have affiliate agreements or any commercial relationship with any business or website. We do not link to any commercial websites (we only link to a few scientific journals). We do not receive any financial or other support from any anti-vaccine organizations, or anyone. The vaccinepapers.org project is motivated purely by concern about widespread health damage from the overuse of vaccines . The media and medical establishment are blatantly lying about what science is discovering about the dangers of vaccines. Our goal is to explain the science and make it accessible, so people can see for themselves how the media, pharmaceutical industry and medical establishment are deceiving the public. Why don’t you publish a peer-reviewed paper on your theory that vaccines cause autism via immune activation? Because it would be ignored. As the content here demonstrates, there are lots of important scientific papers that disappear in the science journals. Whats needed today is an explanation of the science for intelligent non-specialists, showing how the scientific results fit together to tell a story. We reach a much larger audience this way. Also, a blog allows instant updating as the science progresses. And a blog can include a diversity of topics and connect them in ways impossible to do in a scientific paper. Who are you guys? Why don’t you say who you are? How can we trust you if we don’t know who you are? Because it really doesn’t matter, unless you are in the habit of judging ideas by where they come from, instead of by the scientific evidence. Vaccine advocates are addicted to the lazy, intellectually vapid practice of “argument by authority”. For them, all that’s required to answer the questions of vaccine dangers is to assert the CDC, WHO, and AAP as “authorities” and parrot what they say. It’s so easy! No need to look at the science, or think for yourself, according to vaccine advocates. This is absolutely foolish. Scientific ideas and opinions must be judged by the evidence, not according to whether the source is perceived as an “authority”. All that really matters is the science and the evidence. To determine if VP is trustworthy, all you have to do is consider the opinions on these pages in view of what the science says. Then do the same for the CDC, WHO, AAP and other so-called “authorities”. So don’t take our word for the claims made here. Read the scientific evidence for yourself. Additionally, we remain anonymous to avoid nasty “ad hominem” personal attacks and internet harassment. Unfortunately, such tactics are commonplace in the vaccine debate. There are considerable personal and professional risks in being associated with vaccine criticism. By remaining anonymous, attention is focused on where it belongs: the science. Our goal is to encourage people to look at the scientific evidence for themselves, and remaining anonymous furthers that goal. We intend to go public in the not-distant future. We invite vaccine defenders to find flaws in our arguments and write about them, here or anywhere. Have a go at it, Orac, Skeptical Raptor, Steve Novella and Science Based Medicine! More difficult that figuring out how to go to the moon? Really? That's the best he can do? What a damn clown. Hi ICFreely, I had not been to the site vaccinepapers.org, but I read the article you linked. In my opinion, the writer is a legitimate opposition voice. Basically I go with feeling on judging who is real opposition or fake opposition. I felt the points in the article were too high level and coherent for a false opposition. Like people are not aware that most doctors don't read the scientific papers. The doctors are really good at diagnosis, and then most doctors simply follow the medical guidelines. The guidelines are developed by teams of scientists and doctors who are specialized in certain diseases.